Michael Thompson watches his tee shot on the 17th hole island green during the second round of THE PLAYERS Championship. 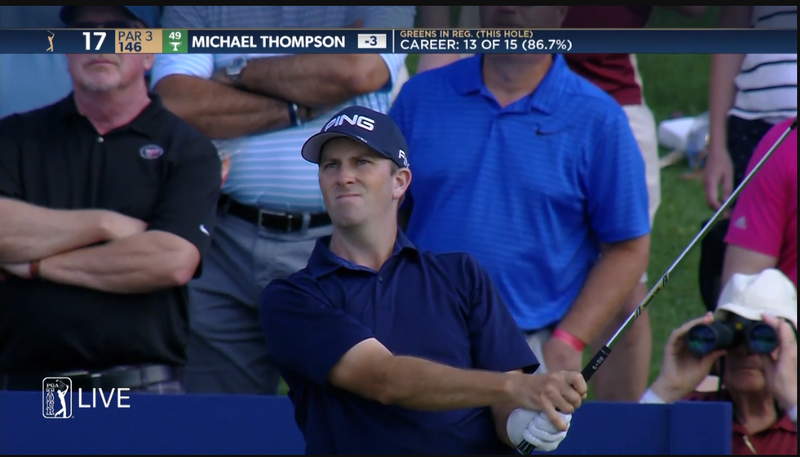 Michael Thompson is in the middle of his most consistent stretch of play on the PGA Tour ever so it doesn't come as a surprise that he made the cut at this year's PLAYERS Championship despite having missed the cut in this tournament in his previous three appearances. He used a great three under par round on Thursday to put himself in good position and followed it up with a one under par round on Friday to ensure his opportunity to play the weekend. He is currently four under par for the tournament and is tied for 29th. He will play Saturday's third round, also known as moving day, with Justin Rose. They tee off at noon EDT. Michael Thompson hits his tee shot on the 12th hole during the second round of THE PLAYERS Championship. 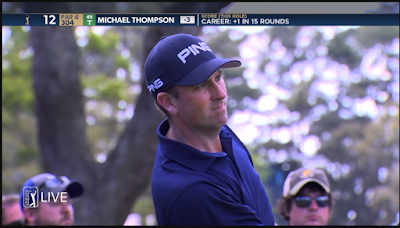 Michael Thompson watches his tee shot on the 12th hole during the second round of THE PLAYERS Championship. 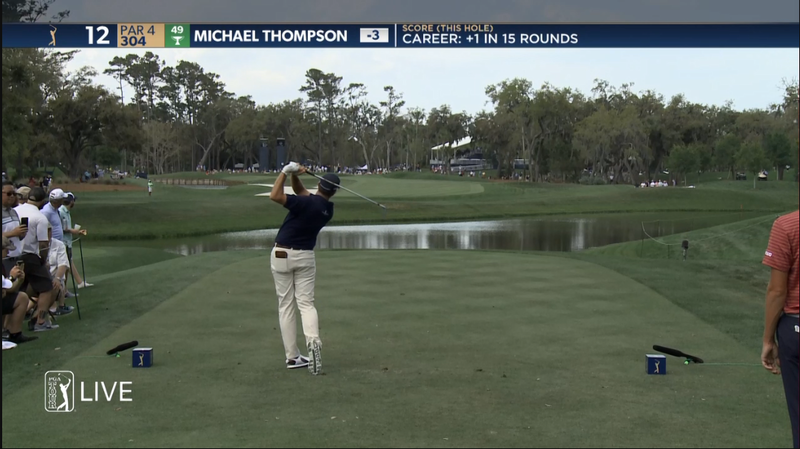 Michael Thompson hits his second shot on the 12th hole during the second round of THE PLAYERS Championship. Michael Thompson hits his tee shot on the 17th hole during the second round of THE PLAYERS Championship. 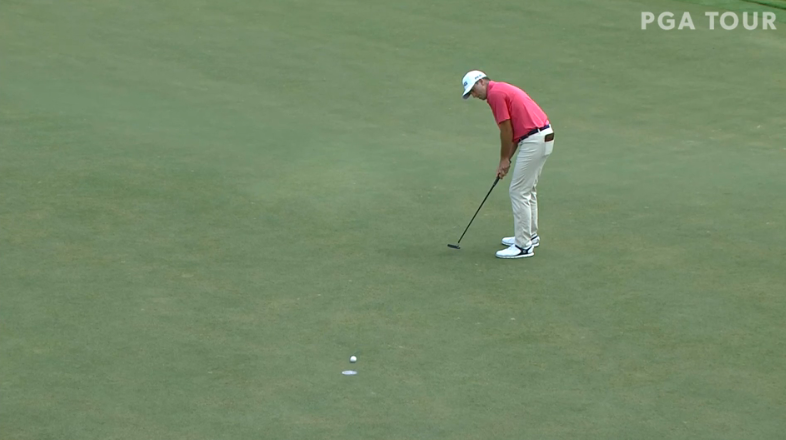 Michael Thompson makes his par putt on the 17th hole during the second round of THE PLAYERS Championship. 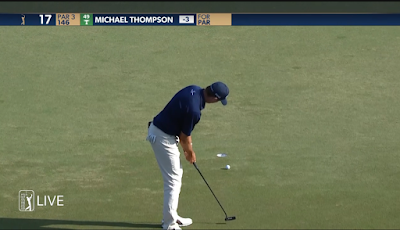 Michael Thompson drains his birdie putt during the fourth round of the 2019 Honda Classic. After tearing up the West Coast Swing with his ball striking, Michael's putter came alive last week at the Honda Classic. He rode his flat stick to his fifth consecutive top 20 finish and his sixth of the year in eight starts with a T-16. Michael was third in strokes gained putting for the tournament gaining nearly 8 and half strokes on the field. Michael's consistently excellent play over the last few weeks has earned him some nice perks including entry into this week's Arnold Palmer Invitational and he is all but guaranteed a spot in the Players Championship in two weeks. Technically he is the first alternate in that field but not all of the players ahead of him in the priority list are healthy so he will get into that event based on his current status on the FedexCup points list (41st). His strong play will also ensure he remains at, or near, the top of the reshuffle list through the Charles Schwab Challenge on May 26 and, in reality, all year long. It wasn't a win today at the Honda Classic but I locked up my card for next year and the wine still tastes good tonight! It was also nice to see Michael get some TV time. Obviously he had won this event before but he's also getting credit for his excellent form since the start of 2019. Thompson Plays His Way Into Genesis, And It Was Very Good! One week ago Sunday, Michael Thompson finished T10 at Pebble Beach, guaranteeing a spot at Riviera Country Club's Genesis Open. His solid play continued at the Genesis, finishing the four rounds: -2, -7, +2, -1 for an overall score of -8, T7. That's his best finish on the PGA Tour since 2016. He was interviewed on CBS after his round on Saturday. He credited his recent success on feeling healthy thanks to a physical therapist who was added to his team for 2019. He also mentioned the importance of routine and consistency in doing practice drills. He commented that his swing coach had been helping him develop a new swing, and that he was happy to finally see some positive results from making that change. Earned his way to the #1 spot on the reshuffle list which means he'll be receiving more tournament entries. Is all but guaranteed a tour card for next year, based on where previous year's FedEx Cup lists had their cut off. So yeah, it was very good indeed. 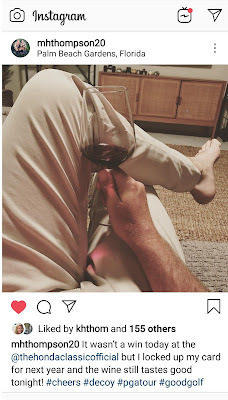 Michael's been away from home for quite some time now, so he'll be taking a little time off, but will be back in action at the Honda Classic. I won't be surprised to see him make it onto Rob Bolton's Sleeper Picks for that tournament, if not the Power Rankings. Could the magic of Michael's 2013 Honda Classic win be repeated? I can't wait to find out. Michael Thompson is enjoying his best start to a PGA Tour season. After a sparkling six under par 66 during today's final round at the AT&T Pebble Beach Pro Am, Michael will finish tied for 10th. It's his second top 10 in the two West Coast Pro-Ams this year. As a benefit of the top 10 finish Michael gets into next week's Genesis Open at Riviera Country Club. He had been the first alternate but now he doesn't need anyone to withdraw in order to make the field. Michael's round Sunday was bogey free in wet, windy conditions and moved him 26 spots on the leaderboard. It was by far his best round of the tournament. On the year, Michael has made 5 cuts in the six events he has played and has four top 20 finishes including two top 10's. He will be moving up the reshuffle list which should help get him into more events over the next few months on Tour. The reshuffle list will be reset at the end of the Genesis Open. 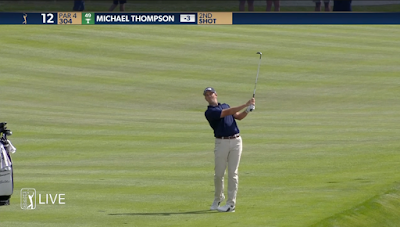 Michael Thompson finished the Desert Classic with a birdie on the final hole to secure his first top 10 finish of the 2018/2019 season. In the end, Michael finished tied for 9th at 18 under par. Michael's final round was up and down for the first nine holes of the day where he had both an eagle and a double bogey over that stretch but he righted the ship on the back nine where he carded four birdies. Michael will look to carry his momentum into this week's Farmers Insurance Open at Torrey Pines. He tees off in the first group from the first hole on the South Course at Torrey Pines. He is grouped with Nick Taylor and Brandon Hagy. They tee off at 9am PT. The following videos aren't very good and I take full responsibility for their poor quality but they give some flavor to the tournament so I posted them anyways! Michael Thompson's third round at the Desert Classic was even better than his first two. He shot a seven under par 65 and is now tied for 5th heading into Sunday's final round at -17 for the tournament. His seven under par round contained nine (yes you read that right) birdies. 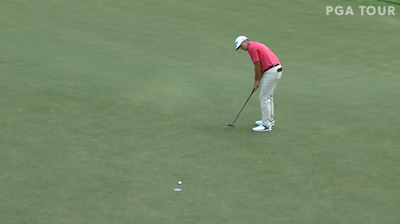 He actually birdied six of his first nine holes to climb the leaderboard early in the day. 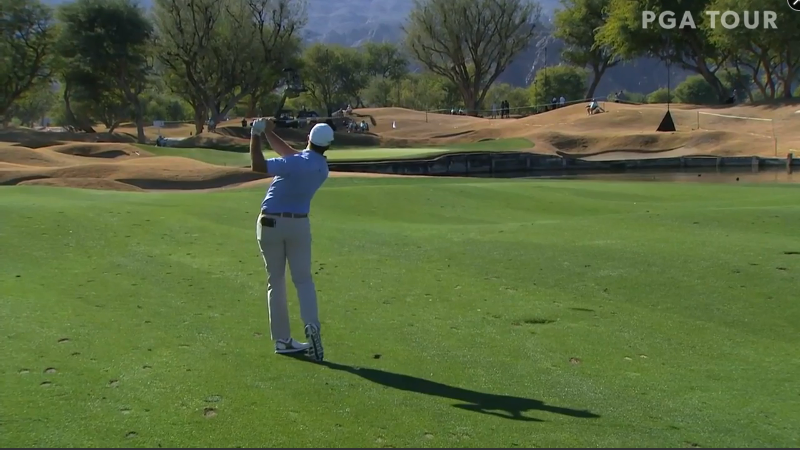 Tomorrow's final round will be played on the Stadium Course at PGA West which is the same course he played today. Michael will be playing with Patrick Cantlay and Steve Marino in round four. The trio tee off at 10:30am PT. Thanks to my lovely and generous wife I'll be making a road trip tomorrow morning out to the desert to cheer Michael on. I'll try to get some pictures and maybe even a video or two to post tomorrow night. 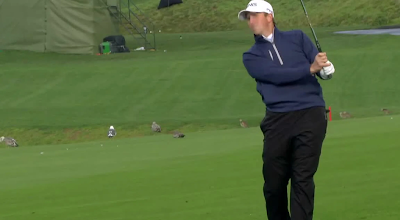 Highlights from Michael's third round at the Desert Classic. After posting a really good four under par 68 in the first round of the Desert Classic, Michael Thompson improved on that by two shots in a sparkling second round and is now ten under par and tied for 11th going into the weekend. The Desert Classic, previously known as the Bob Hope Invitational and the Humana Challenge among other incarnations, is a Pro-Am taking place across three separate courses in the Palm Springs area of California. A cut is made after the third round when each golfer has played each course once. On Saturday, Michael will play the host Stadium Course at PGA WEST. After the cut the Stadium Course will host the fourth and final round. The good news is that the Stadium Course supports ShotLink data so it will be much easier to follow Michael's third round online as the other two courses don't have ShotLink coverage. Michael tees off on Saturday at 8:50am PT.